In a large pan over high heat, heat ~2 tablespoons of olive oil. Sear pork on each side, about 5 minutes per side. Once browned, place pork in a 9×13 baking dish, place in preheated oven and bake until internal temperature reaches 140. Let pork sit for 10 minutes to reach an internal temperature of 145 through carry over heat. Slice and set aside. Meanwhile in a separate medium skillet, heat 2 tablespoon of olive oil over low-medium heat. 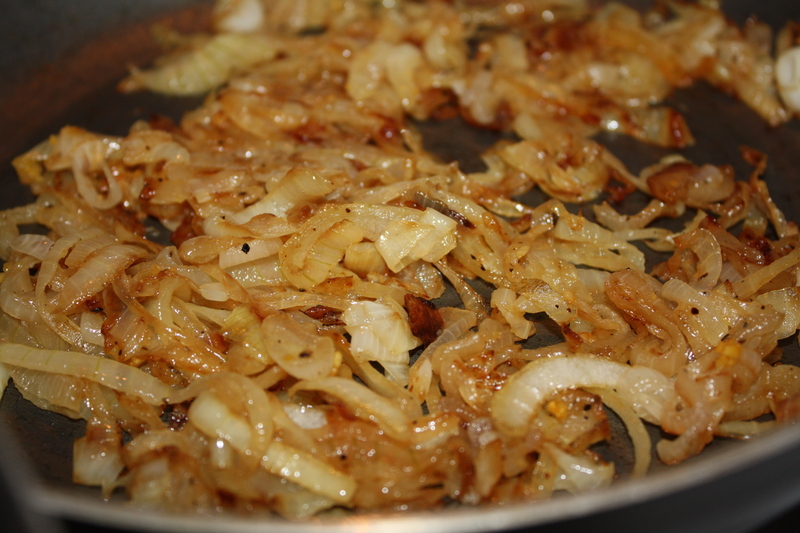 Add sliced onions and cooked until caramelized, stirring frequently – 30 minutes. Set aside. In a large pan, heat 2 teaspoons of olive oil over medium-high heat. Add prepared asparagus to pan. Sautee asparagus until tender and slightly browned, about 10-15 minutes. Plate polenta on serving plates, top with caramelized onions, sliced pork and asparagus. Serve and Enjoy! 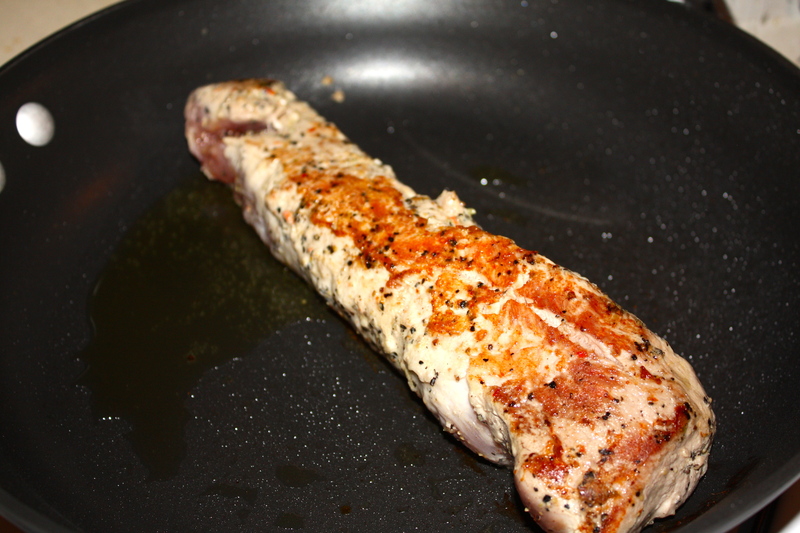 Pork Tenderloin – I used a cracked black pepper corn and garlic marinade with an olive oil base. Marinade pork for at least 2 hours, but overnight is best. 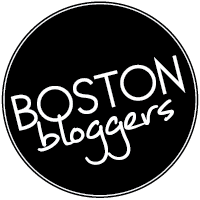 Here we are! It’s time for my whole corn recipe. 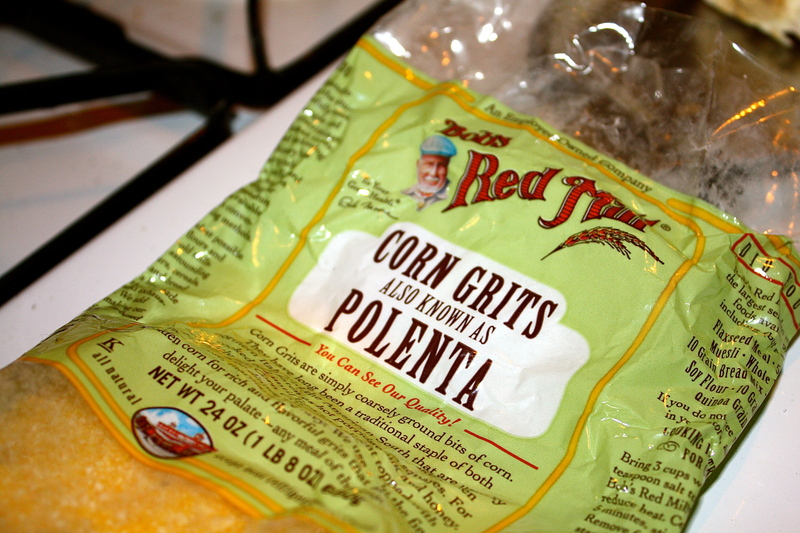 As mentioned last week, polenta (or corn grits) is a source of whole grain corn. I love making this recipe during the week when looking for an alternative starchy side dish. In terms of labor intensity, it’s similar to mashed potatoes and much less work than the carpal-tunnel-inducing risotto. 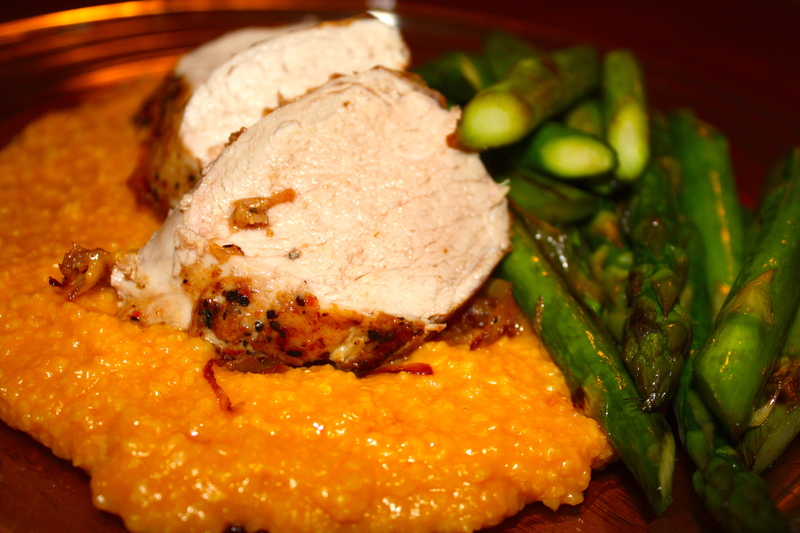 Polenta pairs well with the likes of chicken, pork, lamb, steak or seafood. It also serves as a wonderful bed for roasted garlic tomatoes with sautéed greens like kale, spinach or swiss chard. 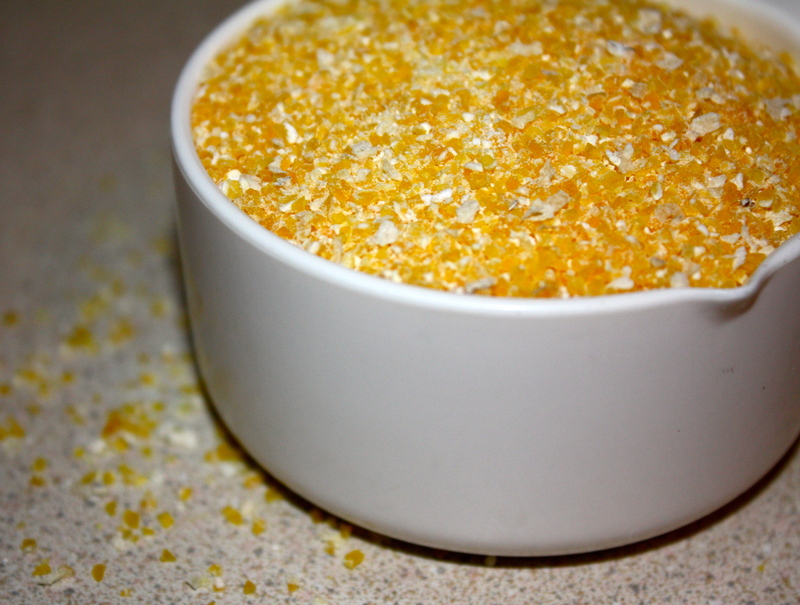 HR’s creamy polenta is a simple quick fix for impressing your dinner guests or enjoying solo on a mundane weeknight. In a medium size sauce pan, bring broth to a boil. Whisk polenta slowly into broth, reduce heat and simmer 20 minutes. 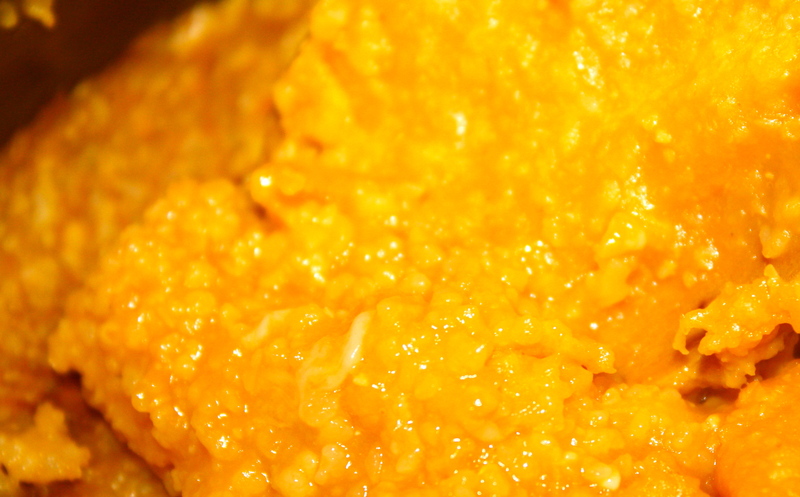 Stir polenta frequently to prevent clumping. Remove from heat, stir in milk, butter, and cheese. Season with salt and pepper. Serve and enjoy! Yep, it’s that simple. Polenta Variation: Fold in caramelized onions or roasted garlic for an added level of savory flavor. Come back next week for another one of HR’s Easy Weeknight Dinner! Slama lama ding-dong, let’s kick off this Wednesday with a discussion on the long forgotten whole grain, corn. It is a vegetable people often write off their diets (much like peas) when it comes to eating ‘low carb’. Sure, the summer months bring this vibrant grain back around, but why do we forget about it the other 9 months of the year? It deserves more attention than that! You see, carbohydrates are an essential part of the human diet. They provide our bodies with the energy necessary for day-to-day living and it’s a macronutrient found in many different types of foods. Whole grains live in one featured corner of the carbohydrates world. Wheat, wild rice, oats, quinoa, millet and barley are just a few of the heavy hitters. These days, it seems as though everyone is either swearing off grains all together or trying to find the next ‘it’ grain. We’re here today to talk about one sadly forgotten whole grain, corn. For a refresher on whole grains (what are they and why are they important? ), please see The Healthy Revival’s Holy Whole Grains post. When we think of ‘bad’, natural foods many will reference potatoes, peas and corn. Corn. Psh! It’s just a carbohydrate trying to pass itself off as a vegetable! In some ways, sure. But corn is not the enemy nor should it be forgotten. Taco shells are one prime example of this corn misconception. While out to lunch with a friend a few short weeks ago, I recall my eating partner changed her entrée of choice due to the fact her fish tacos were to be served in corn tortillas. When I inquired what made her change her mind, she simply replied ‘corn tortillas’. Now I wasn’t about to get into the fact that she probably could have asked our server for an alternative option because it took her a solid 20 minutes to decide between Fresca and lemonade. I’ve learned to pick my (nutrition) battles. But really? Are we all under the impression white flour tortillas are healthier than their corn counterparts? I got news my friend, they ain’t. To focus on tortillas for a minute, corn tortillas have fewer calories than flour tortillas. They are also a whole grain, unless you’re buying whole wheat tortillas – then it’s all the same. Corn tortillas are typically smaller than flour, so you’re also exercising portion control in the process. Don’t let the fact that something is made from wheat fool you like it did my dear lunching friend. The key when looking for corn tortillas (or anything corn derived) is to make sure the words ‘degerminated’ are not used in the ingredients list. Opt for products with ingredients listing ‘whole corn’. 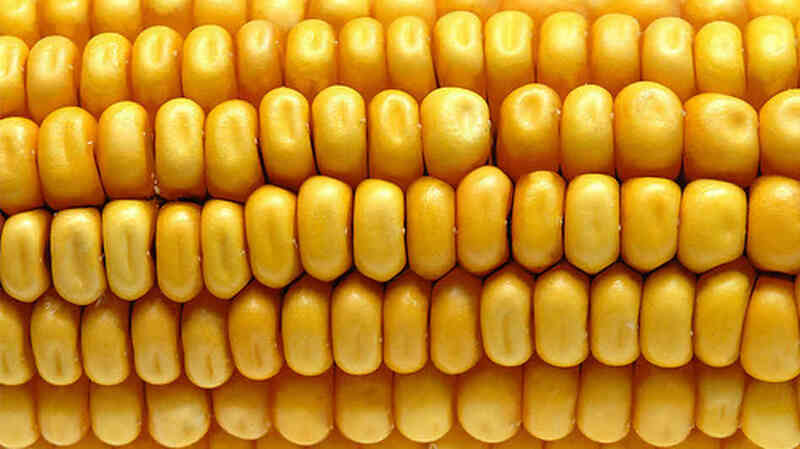 You see corn is a great source for fiber (both soluble and insoluble), folate, vitamin C, potassium and protein. Corn is a grain that has a lot to offer your diet and as long as you don’t confuse it with eating a vegetable, I think we’ll all be okay. It’s a grain developed nearly 7,000 years ago in Mexico, spread to the United States and Peru (thanks to Columbus) and is now grown on every continent expect Antarctica. Corn also happens to be an agricultural titan of the United States’ food industry – which I think may be another turn off for some. Corn syrup, corn syrup, corn syrup. Guess what. I’m not some corn junkie asking you to go to your nearest food store and purchase their last 20 bottles of Karo syrup. It should be clear by now I am pushing for whole corn. Beyond tortillas, as mentioned above, other sources of whole grain corn include popcorn, polenta, corn muffins, corn on the cob, and corn cakes. Not to mention, eating corn with beans creates a complementary mix of amino acids (protein) which increases the protein value for our bodies. Just be sure that when you’re combining the two, you have plenty of non-starchy vegetables on the side. Corn can be used a multitude of ways; fold it into salsa, steam corn kernels as a side dish, mash with cumin and tomatoes, throw into salads or added to soups. Bringing this dietary staple back into your diet is simple! Fresh, frozen or canned, it’s available 365 days a year! A food often featured in the summer months has plenty to offer your diet September through May. Come back next week for a featured whole corn recipe!